I’ve been doing a lot of stripping lately. That, and giving the bird too. I swear, this dining room WILL get finished if it kills me. I’ve pledged to finish the dining room before starting any other huge projects around these here parts. And I’m working my badunkadunk off trying to prove I can actually follow through with a project, start to finish. After months of obsessing about my undying love for the Thomas Paul aviary fabric, I finally put my money where my mouth is and ordered two large samples of it. Oh, aviary fabric, how I love thee! I did not know it was possible to love a fabric any more than I already did, but in person, ohemgeee, you are ah-mazing. I was already 99.9% sure I wanted the tangerine one, but I ordered the blue as well simply because it’s just so beautiful. But just to prove to myself that I made the right choice with the orange, I hung them both up with box tape to get a visual of how they are going to look when I take the plunge and order all 6 yards of it. Oh, orange aviary! Just seeing it hanging there against the gray walls and white moulding gives me heart palpitations. I love it so much I can hardly even stand it. It literally takes my breath away. Swoon. I’m holding off on buying the fabric and hanging the curtains until I am done with the table though. I would just simply DIE if I accidentally got paint or something on the fabric that is going to cost more than $120. Yes, $120. This fabric ain’t cheap. 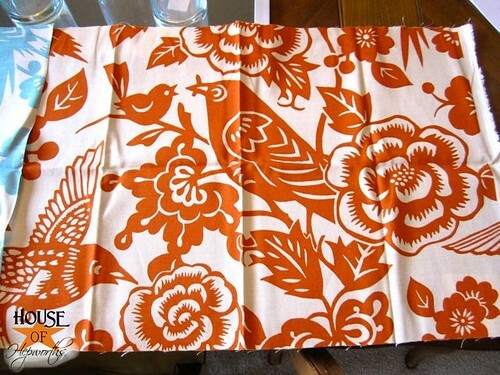 I’m going to go totally cheap-o for the rest of my whole house at $20 for a set of two curtain panels from IKEA , but I just have to splurge on this fabric for the dining room. It is literally a life-or-death situation here. That is how much I need this fabric. So, that is the huge update on the curtain front. As for the table… major progress is being made, and I couldn’t be more giddy about it. 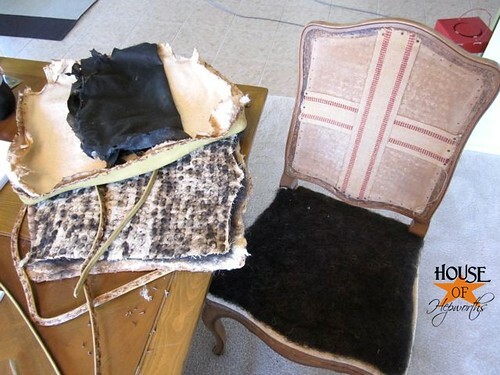 For starters, I took the upholstery off one of the chairs so I can see the innards of it and how it is assembled. This is how I work. I take things apart, see how they are built, and then assemble a plan from there. 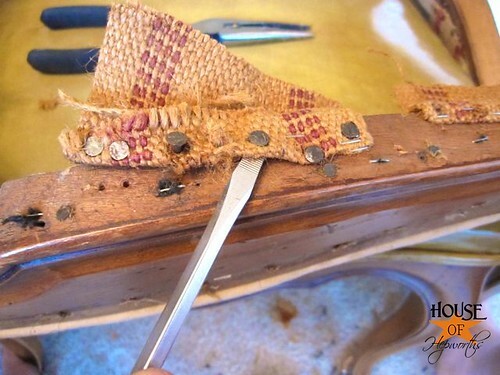 Oh-em-geeee, this chair had more nails and staples in it than actual wood. Taking all the nails and staples out of TEN chairs is going to send me to the loony bin for sure. 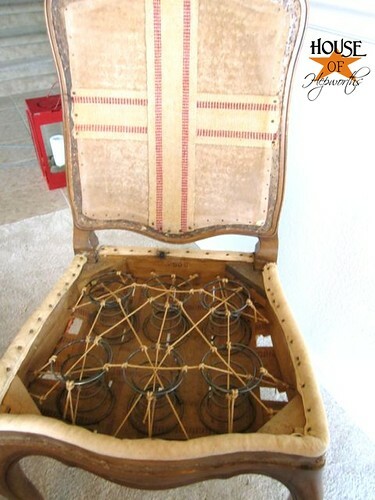 I guess I already knew, but it hadn’t really dawned on me that the innards of these dining chairs involve springs. Springs. In all ten chairs. And they are s-h-o-t.
Have I ever in the history of my whole life (on this blog at least) mentioned that I don’t do springs? Like, as in, they scare me. They terrify me. I AM NOT A PROFESSIONAL SPRING-UPHOLSTERY-REFINISHER-PERSON. So, in other words, THE SPRINGS HAVE GOT TO GO. Without much of a any plan, I cut out the springs and stripped the chair down naked. So now I’m left with this chair that makes a better toilet than a chair. On a side note, this chair weighs about half what it did before I pulled all the crap off it. HALF! I have thought about this chair situation for a good week or more now and finally have come to the conclusion that I DON’T DO SPRINGS. So I concocted a plan. If this plan will actually work is still up for debate, but srsly, I am 100% confident I can pull this off in the end. The plan involves making a wooden seat to fit in the chair. From there I’ll add new foam and padding, and then assemble the upholstery the same way it was attached before. The best way to cut 10 new wooden seat bottoms for these chairs is with a template, so I went to work cutting one out of foam board. 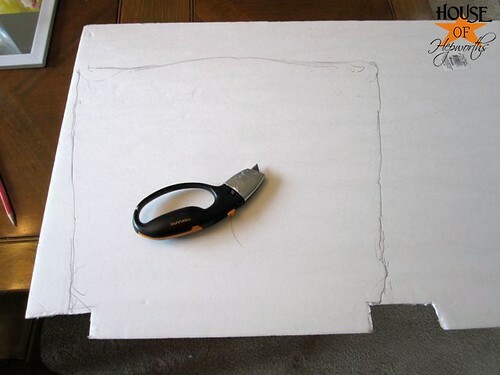 The plan is to just trace this template 10 times onto some wood, then cut it out with the jig saw. We shall see. I think the hardest part of this project will be removing all 10 billion nails and staples from all 10 chairs. And choosing fabric. I seem to be plagued with fear over that. See how nicely my template fits into the chair? I am planning on painting the table, but I had to strip the top of it anyway due to the 50 year old poly bubbling up and flaking off. The whole top was damaged like this, so I figured the easiest way to tackle it was to just strip the finish off and start from scratch. Good times, lemme tell ya. I started with this stripper; Citristrip. It was a little more than some other strippers (this one was about $12), but it said it was okay to use indoors. 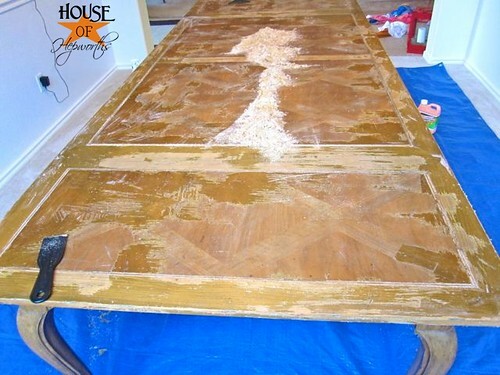 The table is mundo-huge, so I’m refinishing the entire thing in the dining room itself. I needed a stripper that would be okay inside. It was surprisingly easy to use, though it was really gross and messy. I just painted globs of the Citristrip all over the top of the table and left it there for about an hour. After an hour it resembled dead skin off the heel of your foot. I know, disgusting, right? I scraped all of it off with a plastic scraper. Again, pretty easy and I didn’t even need much elbow grease either. This poly on the table was tough though. I had to do two full cycles of the Citristrip to get all the top coat off. Once I was finally done I cleaned the table really well with some cleaner. I am blown away with how good the top looks now. The poly that was on it apparently had yellowed. I thought the table was stained yellowish, but it was really the gross top coat. Now the table looks so good. So now I’m at a cross-roads. I was planning on painting the top. I still probably will. But when I stripped the top coat, I am now left with this really nice wood pattern on top. 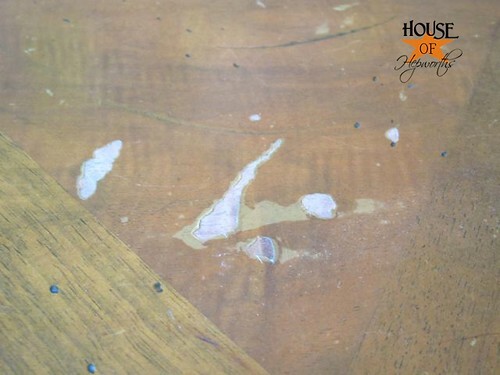 I have thought about staining it instead, but there are still several spots on the table that are chipped or ruined that will need to be filled with wood filler, so I don’t think staining will work anyway. And that my friends is what I’ve been doing the past week. That and pinterest. That site is addictive. Like crack. Fo’ shizzle. 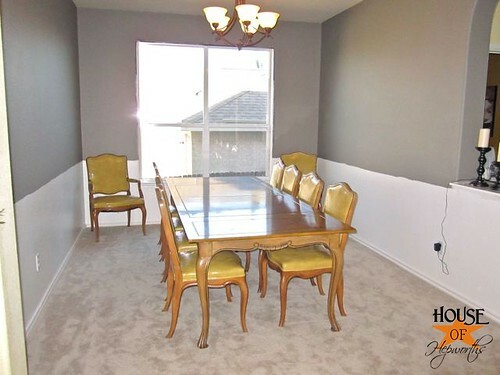 Please assure me that a black table and chairs with some type of light upholstery will look great. Why is choosing a paint color so hard for me? Love this post!! I can’t wait to see the final product(s). I also get horrendous anxiety when trying to decide on a paint color. Whether it’s walls or furniture. Once I’m done I am usually pleased with my choice. I’m sure yours will be beautiful! Your plan for the chairs is EXACTLY what I would have done. I hope it works! 😀 The orange drapes are going to look phenomenal in that room…in fact I am so excited to see how the whole dining room pulls together!! I don’t know how bad the table is with chipping and all but would it work to mask off the srips and paint them a white stain that will let the design show and then paint the rest black? If you end up doing the black and white combo on the chairs? Just a thought. I LOVE it. I want that fabric so bad!!!! I think the table is beautiful!! I think it would look great black but it would be totally cool if you stained the insets or diamonds ebony and painted the ‘x’ parts white or black. I know, more work, but it could be soooo cool!! 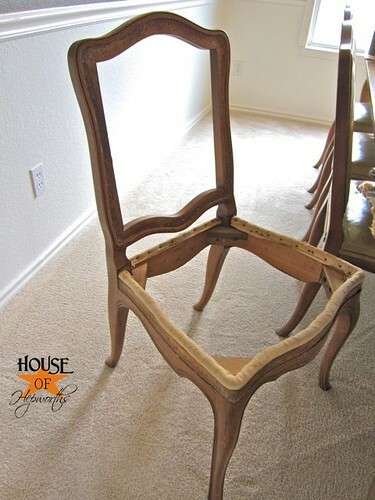 Good work and good luck with the rest of those chairs! I hope you at least try to stain the top, you might be surprised. No matter what, I look forward to seeing the finished product! LOVE the tangerine! Of course it will look splendid with the table painted black. This, obviously, has nothing to do with the fact that I am an OSU alum. 🙂 Seriously, I have had my eye on that fabric for a while – now I feel compelled to purchase some. Can’t wait to see the finished room! Wow, you have been working hard. It looks sort of daunting. But then, you’re a lot younger than me. 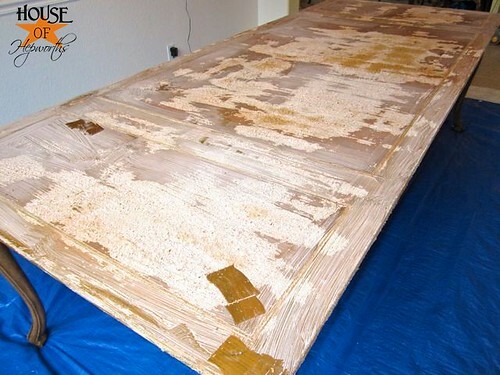 In the end, I think your dining room is going to look stunning. It’s coming together nicely! 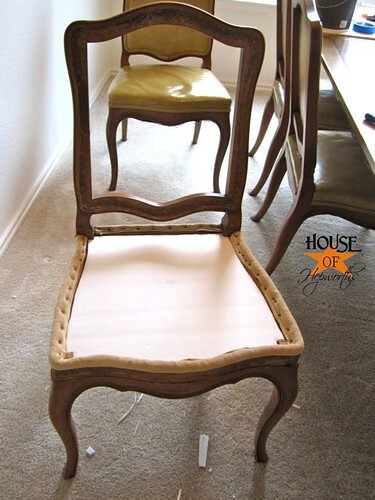 Rest assured, a black table and chairs looks great with a light colored fabric. I have a black granite topped table with black wood chairs…they have a cream, nubby fabric. There is a picture on my blog of the table and chairs, but if you want me to send you one with the chair pulled out, I will. Wow! Lots of work…but love the way the room is shaping up. OR – What about painting your chairs the ORANGE that your curtains contain, then white table and chairs and grey/blue velvet seats? Love the drapery fabric, my personal favorite color is aqua, but I think the orange is going to just pop in that room and I think even I would choose it over the aqua. Those drapes are going to be awesome! Those chairs are amazingly well-made. I haven’t seen springs in upholstered dining chairs in forever. Your armchairs may have bigger seats than your armless chairs, I know my dining set is that way, so you may need separate templates for the two “captain’s” chairs. Just thought I’d throw that out there. 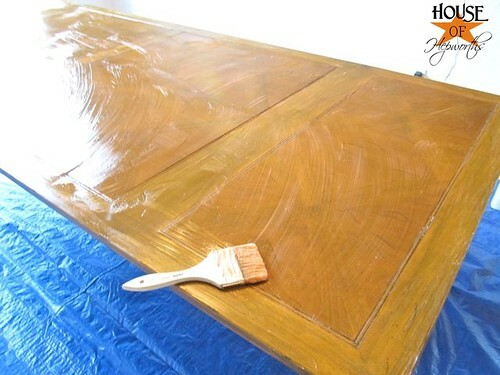 Have you considered using colored wood filler on the table top? The Home Depot near me has wood filler in every wood shade of the rainbow, even ebony, white-wash and white! 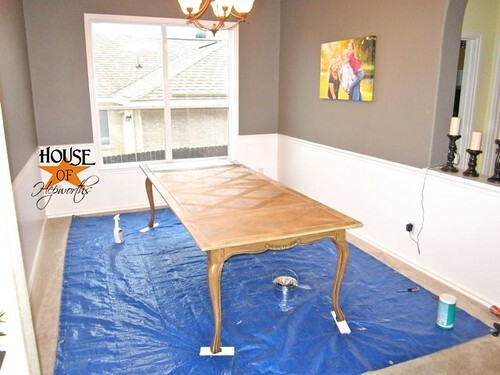 Maybe you could decide what color you want to stain the table top, then use that same color wood filler to fix any damage and then stain away? 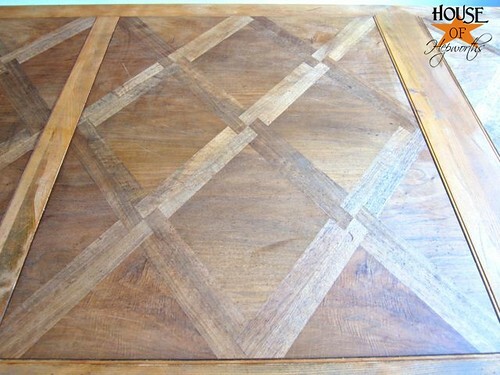 The wood-work on the table top is just so gorgeous. That entire dining set appears to have been well-made and probably quite expensive in its day. The room looks better already, I was seriously worried about your kids living in your house with what was obviously the scene of a horrible crime against Barney! But now I’m thinking I’m going to have to change the accent color to orange. I’ve been seeing orange everywhere and it really is beautiful and unexpected! Now can you help me convince my husband to get all new orange-accented upholstery in our bedroom? 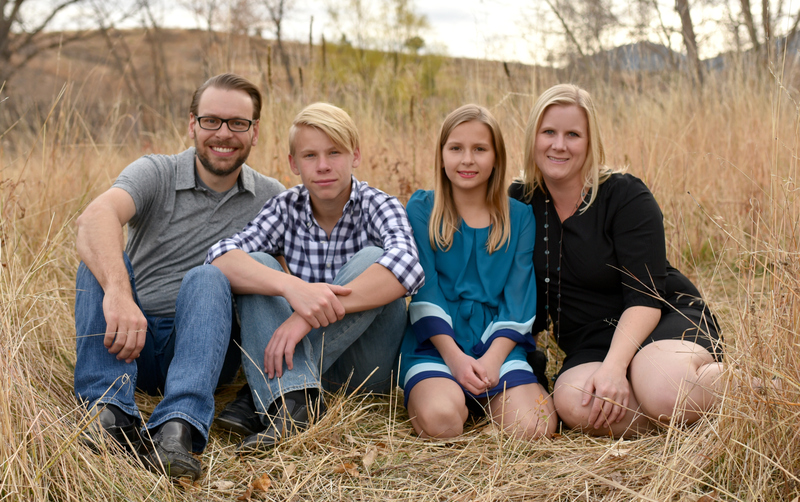 Alison-loving every minute of your blog!!! I wanted to let you know I think black on the table and chairs is going to be great, and it will highlight the fun curves and shape of the set! Question for you….if I send you a pic of my current dining room set will you give the “What would Alison do” advice? I said it before and I’ll say it again! Stain, stain, stain! Especially after you revealed this beautiful pattern! The chips and cracks will only make it have more character and would look so unique. You could totally still do the black, although, the table is so massive that it might be a black overdose with all those chairs as well. 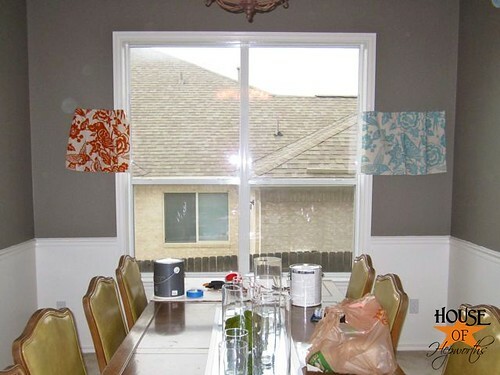 Have you thought about painting the chairs a different color than the table? Just some ideas! Can’t wait to see what you are going to do with it!! Hi Allison! I think the black would look fantastic! However, I also like the pattern on the top so I understand your dilemma. Have you thought about a really dark stain? 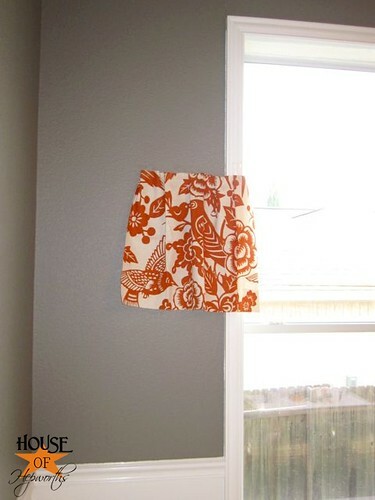 It would still have great contrast with your walls while preserving the cool pattern on top. Anyway, just giving an unsolicited suggestion 🙂 But that being said I think black would look great and probably be easier so I totally support that decision! PS. 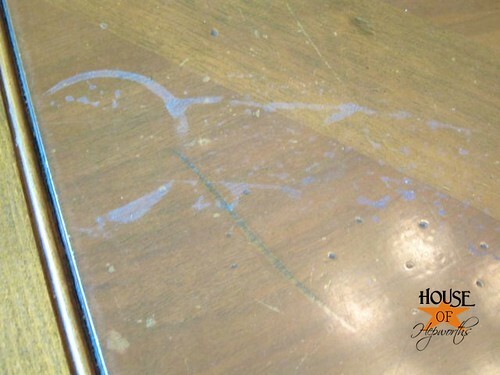 I am so very impressed you can stain the table in your living room. I’m such a slob I’d have it all over the walls and the rest of the house. You’ll have to share your secrets! Allison, the pattern on the table-top is beautiful! IMO, it would be such a shame to cover it with paint! Even if you don’t stain it, maybe a dry-brush technique would let the pattern show through. Also, you probably already know this, but, don’t throw those springs away! (For all I know, you may have already done some of these on your website. If so, please forgive my ignorance.) 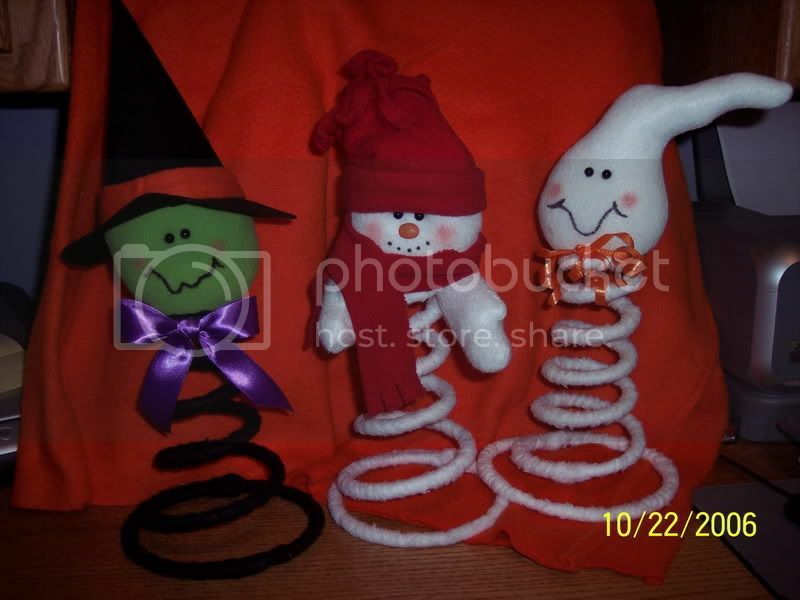 I have seen some really cool things made from old springs, for example, candle holders, wine racks, even these cute little boogers I found online at gardenweb.com: http://i99.photobucket.com/albums/l317/judypudy/000_0045.jpg. You will have a ton of springs from all those chairs. I love the orange – that’s the way to go for sure! WOW! You are working hard! I think that black will look fantastic and I can not wait to see the drapes! You seemed like the stripper type to me…. Wow!! Who would have ever thought you had that pattern under it! What color were you thinking of painting! First thing that popped in my head when you mentioned staining is the contrast that the pattern may make. That could be really good or bad! If it turns out to be not what you wanted you can always paint! I am seriously addicted to Pinterest! It takes serious self control to stay focused at work…which I’m failing at! 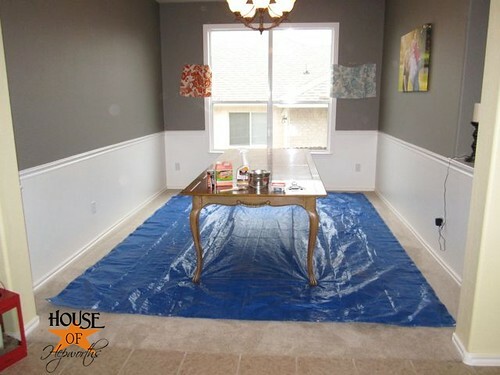 I vote for staining the table top and painting the apron and legs. That detail on top is just so pretty! Love that fabric!! Since you don’t want it…I will take the blue swatch! And that table will look great dark…go for it!! Be fearless!! You can do it!! Alison, IMO it would be a shame to cover that beautiful pattern on the tabletop with paint. If you don’t want to stain it, could you maybe use a drybrush paint technique that would let the pattern show through? Also, you probably already know this, but don’t throw away those springs! I have seen a lot of cool things made out of old springs. Gardenweb.com has several ideas and pictures posted. I tried Citistrip for the first time a few weeks ago – loved it too! Now, on the table – that top needs to be seen!! Stain it, pretty please! 🙂 Someone suggested ebony stain which could be pretty and still in your black plan. Don’t worry about the imperfections – it adds character!! and with kids you would probably get knicks in the black anways. Personally I would stain the top a dark ebony or walnut, paint the legs white or a lighter gray then your walls (and distress them if that is your style). Then the chairs, I would paint white and maybe use a fun fabric (solid orange pulled from your curtains or a fun stripe). Although black chairs with a light fabric would probably work too. Look for some sample pictures to imagine it on Pinterest – that is what is great about that site! You are amazing! It looks SO good. Please stain the top!! The wood is gorgeous. 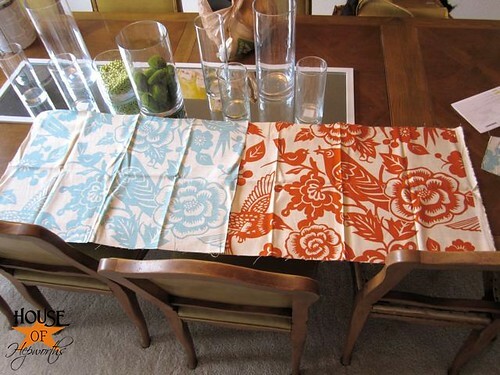 The chairs and table will look amazing in black especially with the graphic orange print curtains. I love the idea of light fabric on the chairs. I love the tangerine curtains. They are so much more fun than the blue (although I would normally always choose blue over orange). Great job so far, I can’t wait to see it all come together. <3 the tangerine fabric!! I'm just catching up on your posts, found you (again) on Pintrest. Oh how right you are, sooo addictive. 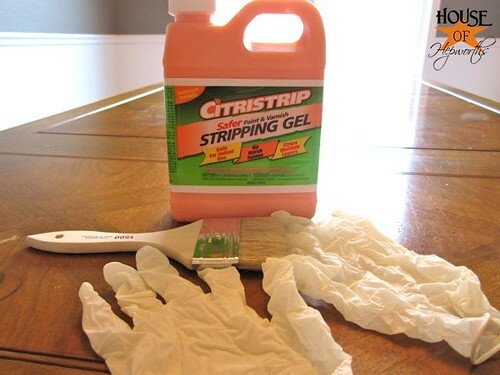 I was wondering what cleaner you used to get the rest of the citri-strip off the table top when you were finished. I have several doors I started with citristrip, oh what a nightmare they have become, I guess the 12+ layers of paint might have been part of the problem, but I can't seem to get them "clean" once I have the paint off.